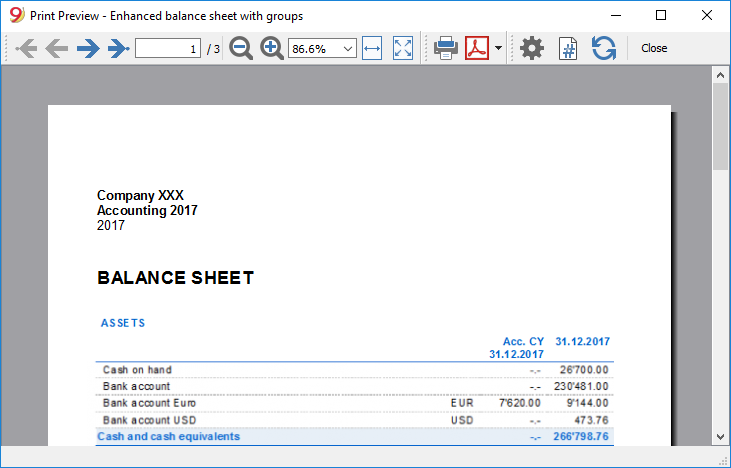 All the printouts of the various accounting documents can be saved in PDF, HTML, MS Excel and copied to the Clipboard, allowing the user to also access them many years later. The button pulls up the Printer Setup window from Windows. The selections are only valid for the current working session. Permanent alterations need to be input using the Windows control panel. Horizontal or vertical printing needs to be input under Page Setup and is only valid for each view. Data are not really exported to Excel, but they are exported in html format with the .xls extension. Excel warns that data are not in Excel format but opens the file anyway and keeps some (but unfortunately not all) formats.